At Brigade Games, we can also find female personnel to the Napoleonic armies in 28mm with this set of two vivandières. Did you also notice the Drum Major and fifer? Pics of them my good friend!… please!…. Does anyone make Vivandiers for the American Civil War? The Perrys do ACW 'camp scenes'. The Perry set has a 'washer woman', but not a uniformed vivandier. 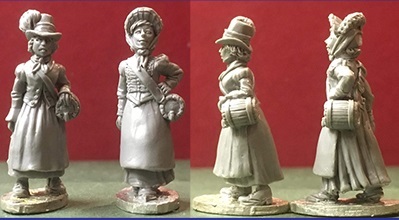 I'd love to get a nice ACW vivandier for my wife (who portrays one).